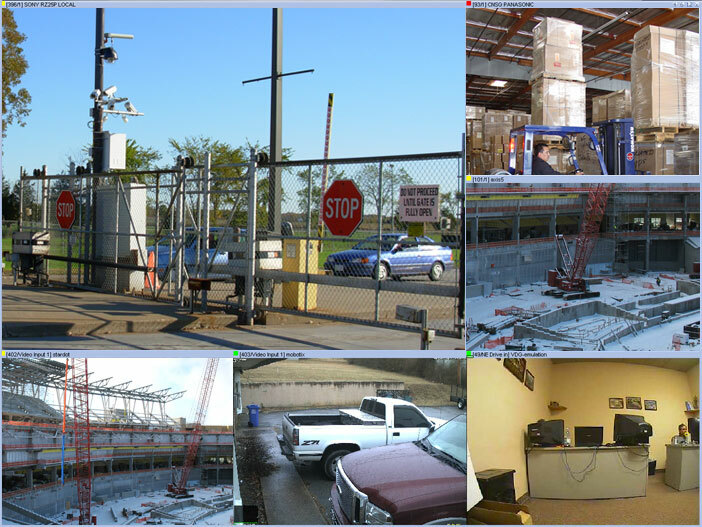 The Multi-camera View provides a quick way of viewing multiple cameras. 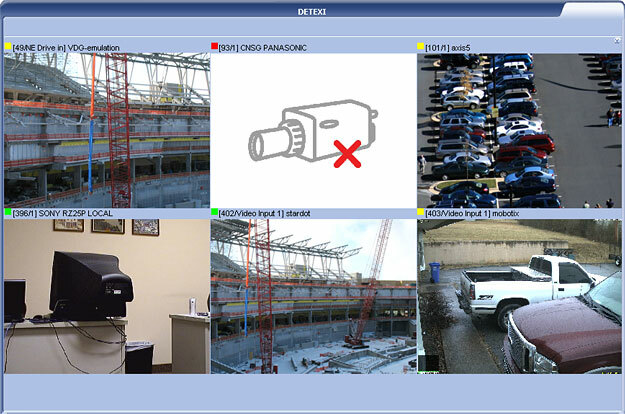 Live Status Indicator — each camera video stream in the Multi-camera View has a colored box icon next to the camera name, indicating the status of the video. If the indicator is red, the live stream is halted. A flashing yellow/green indicator means live video is currently streaming. Standard Tiling — all cameras’ views will be the same size, dynamically sized and tiled with the least wasted space. The Multi-camera View can be changed via Tiling buttons. 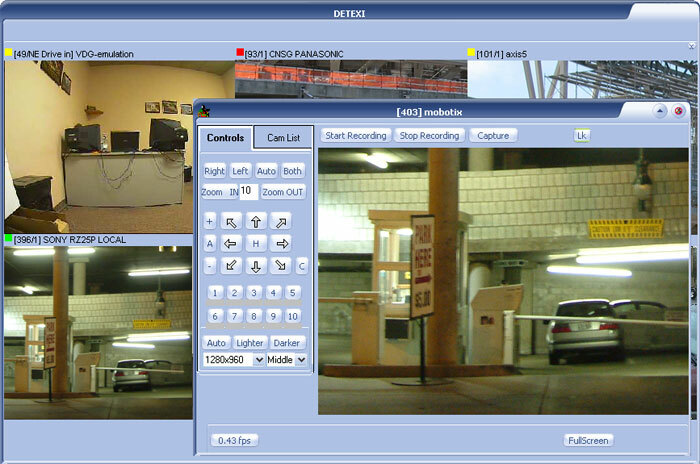 The Single Camera View can be launched from the Multi-camera View for any camera in the group. If more than one camera was selected in the Start page — Camera List and Go button clicked, the Multi-camera View is launched with live video streaming from the selected cameras. The Tiling buttons appear in the upper right corner of the Multi-camera View only if in the Settings under the DISPLAY SETTINGS the Full Screen checkbox is checked. 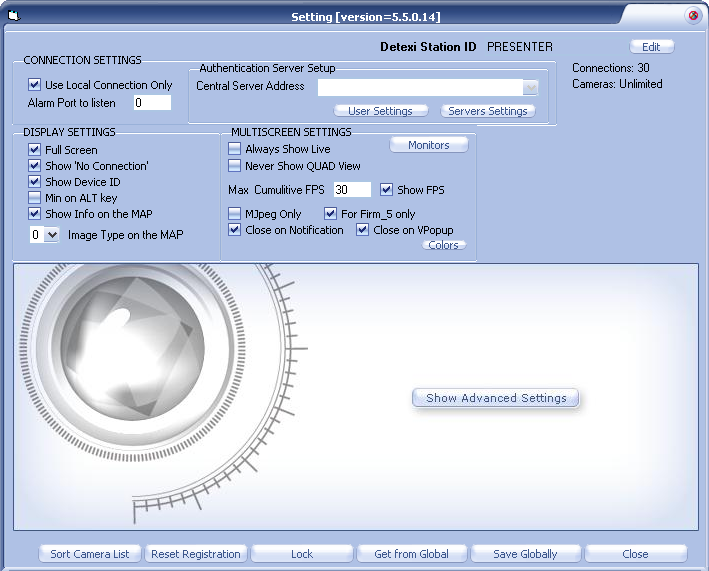 If in the Settings under the DISPLAY SETTINGS the Full Screen checkbox is checked the Tiling buttons appear in the upper right corner of the Multi-camera View. Press one of the Tiling buttons — S, 6 and 12 — to change the Multi-camera View. S — all cameras’ views will be the same size, dynamically sized and tiled with the least wasted space. 6 — only the first (5 + 1) selected cameras will be shown, with the first much larger than the rest. 12 — only the first (12 + 1) selected cameras will be shown, with the first much larger than the rest. To show the camera of choice in the large position — press Shift button, than drag and drop any camera on top of large view or change the cameras order in Settings — Sort Camera List. In the Settings click Sort Camera List button in the bottom left corner. In the Sort the Cameras panel select the camera and move it on the top of the list. 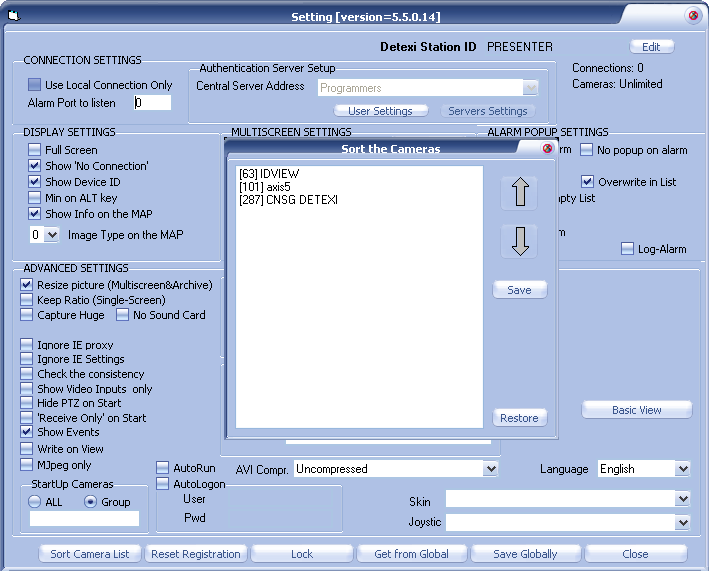 GOTO option, available by right-clicking on any camera video stream in the Multi-camera View, launches the Single Camera View for the selected camera in front of the Multi-camera View providing access to the various camera controls. 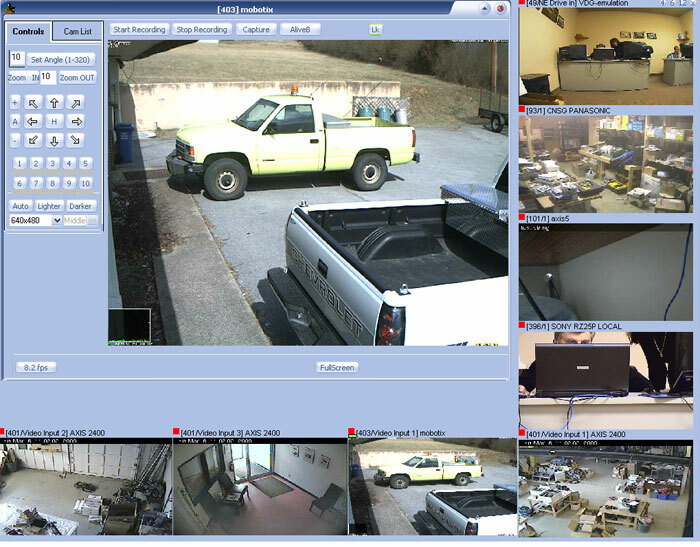 To change the video stream being viewed in the Single Camera View drag and drop any other camera view from the Multi-camera View on top of the current Single Camera View. Enlarge option is available by right-clicking on any camera video stream in the Multi-camera View . It enlarges the selected camera view and displays the camera controls while tiling all other cameras around it. The Enlarge option is only active if in the Settings under the DISPLAY SETTINGS the Full Screen checkbox is checked.